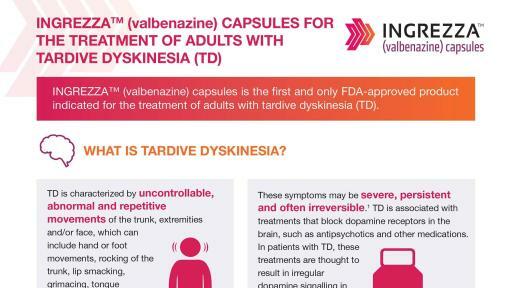 SAN DIEGO, April 11, 2017 /PRNewswire/ -- Neurocrine Biosciences, Inc. (NASDAQ: NBIX) announced today that the U.S. Food and Drug Administration (FDA) has approved INGREZZA™ (valbenazine) capsules for the treatment of adults with tardive dyskinesia (TD). INGREZZA, a novel, selective vesicular monoamine transporter 2 (VMAT2) inhibitor, is the first and only FDA-approved product indicated for the treatment of adults with TD. Clinical studies have shown that INGREZZA provides significant, rapid and meaningful improvement in TD signs and symptoms compared to placebo through six weeks, with continued reductions in TD observed through 48 weeks of treatment. INGREZZA was generally well tolerated, with somnolence as the only adverse event occurring at a rate greater than or equal to 5 percent and twice placebo. In clinical trials, no worsening in safety scale scores for depression, suicidal ideation or behaviors was observed. INGREZZA has been studied in over 1,000 individuals and more than 20 clinical trials. INGREZZA will be in the distribution channel next week and will be available through a select pharmacy network. Promotion to healthcare professionals will commence on May 1, 2017. To assist TD patients in gaining access to INGREZZA, Neurocrine has created the INBRACE™ patient support program, which will immediately begin accepting treatment initiation forms from health care professionals prescribing INGREZZA and work closely with patients and their families to facilitate access. INBRACE is designed to provide personalized product assistance and services. For more information, patients may visit www.INGREZZA.com or call 1-84-INGREZZA (1-844-647-3992). 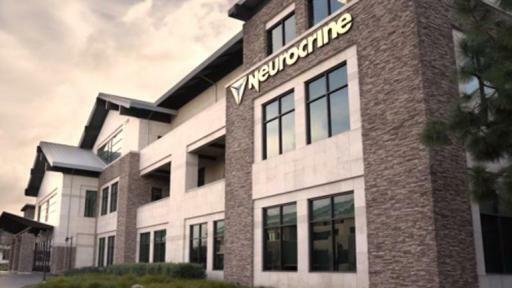 Neurocrine will hold a live conference call today at 5:30pm ET (2:30pm PT). Participants can access the live conference call by dialing 866-610-1072 (US) or 973-935-2840 (International) using the conference ID 99380770. The call and slide presentation can also be accessed via webcast through the Company’s website at www.neurocrine.com. If you are unable to attend the webcast and would like further information on this announcement, please contact the Investor Relations Department at Neurocrine Biosciences at (858) 617-7600. A replay of the conference call will be available approximately one hour after the conclusion of the call by dialing 800-585-8367 (US) or 404-537-3406 (International) using the conference ID 99380770. The call will be archived for approximately two weeks. TD is characterized by uncontrollable, abnormal and repetitive movements of the trunk, extremities and/or face. The condition is caused by treatments that block dopamine receptors in the brain, such as antipsychotics and other medications, which are commonly prescribed to treat mental illnesses such as schizophrenia, bipolar disorder and depression. In patients with TD, these treatments are thought to result in irregular dopamine signaling in a region of the brain that controls movement. 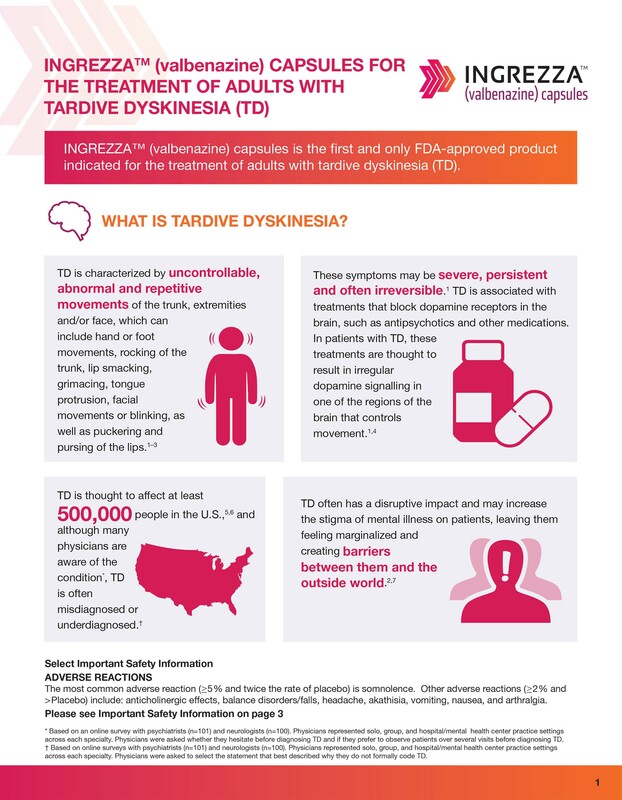 The symptoms of TD can be severe and are often persistent and irreversible. TD is estimated to affect at least 500,000 people in the U.S. The percentage of participants who achieved at least a 50% reduction in AIMS was 40 percent (p<0.001) in participants receiving 80mg/day of INGREZZA compared to only 8.7 percent of those who received placebo. INGREZZA was found to be generally well tolerated, with somnolence as the only adverse event occurring at a rate of 5 percent or greater and twice placebo. 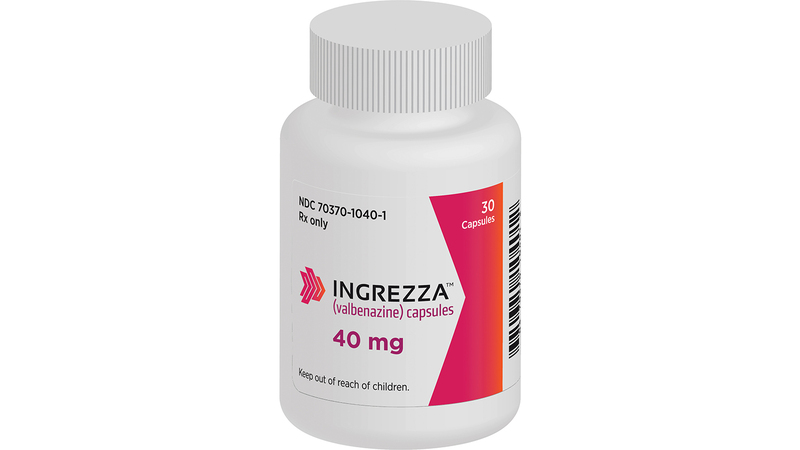 INGREZZA inhibits VMAT2 and is thought to work by reducing the amount of dopamine released in a region of the brain that controls movement and motor function, helping to regulate nerve signaling in adults with TD. VMAT2 is a protein in the brain that packages neurotransmitters, such as dopamine, for transport and release in presynaptic neurons. INGREZZA, developed in Neurocrine’s laboratories, is novel in that it selectively inhibits VMAT2 with no appreciable binding affinity for VMAT1, dopaminergic (including D2), serotonergic, adrenergic, histaminergic, or muscarinic receptors. Additionally, INGREZZA can be taken together with psychiatric medications such as antipsychotics or antidepressants. Breakthrough Therapy Designation was received from the FDA for INGREZZA for the treatment of TD, and the New Drug Application was evaluated by the FDA with priority review. INGREZZA may prolong the QT interval, although the degree of QT prolongation is not clinically significant at concentrations expected with recommended dosing. INGREZZA should be avoided in patients with congenital long QT syndrome or with arrhythmias associated with a prolonged QT interval. The most common adverse reaction (5% or greater and twice the rate of placebo) is somnolence. Please see INGREZZA full Prescribing Information at www.INGREZZA.com. Neurocrine Biosciences is a San Diego based biotechnology company focused on neurologic, psychiatric and endocrine related disorders. The Company's three late-stage clinical programs are: elagolix, a gonadotropin-releasing hormone antagonist for women's health that is partnered with AbbVie Inc.; opicapone, a novel, once-daily, peripherally-acting, highly-selective catechol-o-methyltransferase inhibitor under investigation as adjunct therapy to levodopa in Parkinson's patients; and INGREZZA™ (valbenazine), a novel, once-daily, selective VMAT2 inhibitor under investigation for the treatment of Tourette Syndrome. Neurocrine Biosciences, Inc. news releases are available through the Company's website at http://www.neurocrine.com. In addition to historical facts, this press release contains forward-looking statements that involve a number of risks and uncertainties. These statements include, but are not limited to, statements related to the benefits to be derived from Neurocrine’s products and product candidates, including INGREZZA; the size of the U.S. market for INGREZZA; the value INGREZZA brings to patients; the timing of INGREZZA’s availability; the ability of Neurocrine to ensure patients have access to INGREZZA; and whether results from INGREZZA’s clinical trials are indicative of real-world results. Among the factors that could cause actual results to differ materially from those indicated in the forward-looking statements are: risks and uncertainties associated with Neurocrine's business and finances in general, as well as risks and uncertainties associated with the commercialization of INGREZZA or the development of the Company’s product candidates; whether INGREZZA receives adequate reimbursement from third-party payors; the degree and pace of market uptake of INGREZZA; risks and uncertainties relating to competitive products and technological changes that may limit demand for INGREZZA; risks associated with the Company's dependence on third parties for development and manufacturing activities related to INGREZZA and the ability of the Company to manage these third parties; risks that additional regulatory submissions, for INGREZZA or other product candidates, may not occur or be submitted in a timely manner; risks that the FDA or other regulatory authorities may make adverse decisions regarding INGREZZA; risks that post-approval INGREZZA commitments or requirements may be delayed; risks that INGREZZA clinical trials may not be predictive of real-world results or of results in subsequent clinical trials; risks that INGREZZA may be precluded from commercialization by the proprietary rights of third parties, or have unintended side effects, adverse reactions or incidents of misuse; risks that the Company will be unable to raise additional funding, if required, to complete development of its product candidates or to commercialize INGREZZA; the Company’s ability to meet any of its previously disclosed milestones or financial projections, and changes to the assumptions underlying such projected milestones or financial projections; and other risks described in the Company's periodic reports filed with the Securities and Exchange Commission, including without limitation the Company’s Annual Report on Form 10-K for the year ended December 31, 2016. The Company disclaims any obligation to update the statements contained in this press release after the date hereof.